Since the 1960s, Hinduism has profoundly shaped the West. But it goes beyond vegan food, henna and hippy culture. We’re all one with God; there’s a divine spark within each of us; I’ll find my own path—all of these Hindu ideas have gone global. Hinduism inspired brilliant movies like Inception, Avatar and Interstellar. And many big-name celebrities have famously converted to the faith, including Julia Roberts, Russel Brand and George Harrison of The Beetles. Christians are sometimes known for their fear of other religions. But what if we got over ourselves and asked what we can learn from Hinduism—and how it might point people to Jesus? Hinduism has no founder: there’s no historical figure called Hindu. That’s just a British word for the colourful rituals and beliefs of the Indian subcontinent. Even today, most Hindus don’t know that word—they just know they follow the eternal religion. Eternal is a stretch, but it’s definitely ancient. 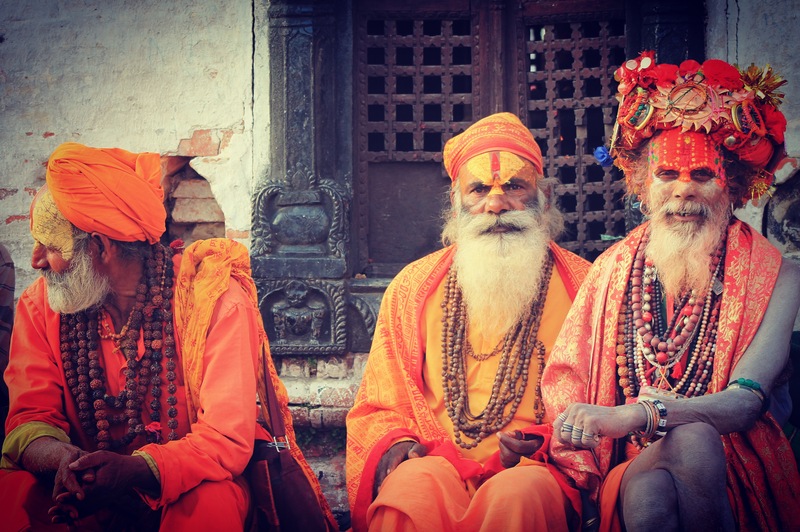 Hinduism predates Moses, beginning around 2000BC—making it the oldest religion in the world. It’s not a neat, easily understood faith. It has no organised hierarchy, no creeds, and no central holy place. It sort of just is. At the centre of this spectacular web of beliefs and practices is one simple idea: union with the ultimate life force. To understand what this even means, we need to take a journey through the deep traditions that have shaped Hindu belief. First are the Vedas. These hymns, curses and chants were brought to India by Persian nomads, explaining how to communicate with a vast array of gods through the use of drugs, and how to appease these gods with sacrifices. Brahman / Behind everything in the universe is a life force called Brahman. Brahman isn’t a who but a what—it has no personality. And Brahman isn’t seperate from the world: it encompasses everything, including you and me. Like sparks from a flame, we all came from Brahman, and to Brahman we will all return. Illusion / You think you’re reading this blog, but actually you’re not. You, your device, and the entire universe is actually just a dream of Brahman. According to Hindu teaching, until you realise this, you’ll stay trapped in the illusion of this world. Reincarnation / All of us, even plants, animals and insects, are caught on a carousel of being born, dying and being reborn again. Reincarnation isn’t fun to a Hindu—it means being spat back out into the illusion of this world; trapped once again in a false existence. Karma / We think karma is doing good so good comes back to me. For Hindus, karma is vengeful—it’s the reason we’re trapped. The poor are suffering now because of their actions in a past life: it’s their fault. As such, I need to live a good life now so I can return as a king, not a cockroach. Release / However, the end goal is actually to not come back at all. Instead, I’m aiming to experience final release from the futile cycle of life. Release isn’t a place; it’s a state of being where I no longer exist—where I’m absorbed back into Brahman, the ultimate reality. The Caste System / People are born into different castes or social orders based on their karma from past lives. Those at the top work in business and government, while the untouchables at the bottom fill India’s slums. Mahatma Gandhi fought the caste system, and today many Hindus reject it, but it remains deeply ingrained in Indian society. Path of Duty. Performing good works that are fitting to your particular caste, and being faithful in giving offerings to the local gods. Path of Devotion. Choosing one of Hinduism’s 330 million gods to love and worship with your whole life—the most popular being Vishnu and Shiva. Path of Knowledge. Denying comforts, chanting scriptures, and practicing mediation and yoga in order to achieve union with Brahman. And that’s a brief summary of Hinduism. Today it’s the third largest religion in the world with over a billion followers. The vast majority of Hindus live in India. Hindu ideas challenge Christians, and in the best of ways. They rattle our safe little cage and make us question everything we thought we knew. Hinduism also reminds us that God is not just far off, but present everywhere; and many Hindus truly know the meaning of spiritual devotion. But where does Jesus fit with Hinduism? It would be too easy to see him as just another guru or god among the millions. But this holy man is different. Jesus’ teachings are eternal, more ancient than the Vedas. In fact, they come directly from Brahman. According to Jesus, it’s true that Brahman is the life force present everywhere, giving unity to the world we see. But Jesus called Brahman a who, not a what. Brahman is actually personal, with a mind, emotions and the capacity for relationship. This makes sense because we are personal. We use logic; we experience joy and sadness; and we relate to others. How could you or I, with all the beauty and wonder of personality, come from an impersonal force? Brahman must have a personality if we came from him. Jesus also taught about karma. He called it sin—actions from our past that have trapped us. But he didn’t teach the path of duty, devotion or knowledge, because they leave us uncertain; we can only know if they’ve worked after we die. Jesus taught a better way of release, one that we can know gives us release in this life. Instead of us making our way back to Brahman, Jesus said, Brahman has come to us. Jesus wasn’t just another spark from the flame: he claimed to actually be Brahman, entering into our world, ending the illusion. Jesus came to show us what Brahman’s personality is like. Jesus performed every good work and lived a perfect life, and this meant his karma was good. And when he died, he took all our karma upon himself, and he gave us his good karma in return. The moment we believe this and devote ourselves to Jesus, we experience final release. When we die, we can be certain we’ll return to Brahman. Not like sparks to a flame. But like children to their father. We’re actually seperate beings from Brahman—and that’s good, because it means we can have a personal relationship with him. This is love. And this is true union with the ultimate life force. We all need a god to worship and devote our lives to. Jesus is the only one who is truly worthy of this, because he’s not one god among many. He’s the one true God. And this God loves and accepts us, no matter which caste we’re from. Claydon, David. Connecting Across Cultures: Sharing the Gospel Across Cultural and Religious Boundaries. Melbourne: Acorn Press Ltd, 2000, 83-94. Dickson, John. A Spectator’s Guide to World Religions: An Introduction to the Big Five. Sydney: Blue Bottle Books, 2004, 17-46. Hi…So well written..you have studied so well…. If, Jesus’s teachings are ancient than Vedas, and if his teachings came from Brahman, from where and when did vedas come? I am going to ask a series of Qs, so reply only if ready to answer all of them… Thanks! Hey! Thanks for your question. According to Christian teaching, Jesus is the eternal “Logos” who existed with God from before time began. The Vedas are, I believe, writings that ancient people compiled as they searched for answers to life’s big questions. Because all of us are made in God’s image, no doubt there are ideas and concepts in the Vedas that reflect the eternal longings God has placed in each of us. It is my conviction that Jesus is the answer to these eternal longings. I hope this is helpful! May be you need to dive more into your teachings first. Jesus is different from christ. Christ is the logo’s while jesus is the man with which the logos associated with, for certain tune. This will solve many absurdities in bible. Also, when you do not know about vedas, please refrain from speaking. Half knowledge is dangerous. I second your conviction on Jesus, The christ. But to understand what vedas are, you need to properly understand what testemants and Bible speak. For example, in my 1st article of blog I show how 4days of creation meant four stages of evolution. The key lies in ‘man is made in image of god’. Anyways, I have no objection to your believes. But when venturing on non native fields, you must be equipped with all answers. Now, for vedas, there is a difference between books and wisdom. No wisdom belongs to one sect of people. Be it Egyptians, chaldeans , kabbalists, indians, who ever it is. No one can claim wisdom to be theirs. Every one searched, FOUND the same wisdom, but cloaked in their tongue of language, seems different. Once the key of symbols is known, you will see how wisdom of all races of all times is same. And there is a difference between Hinduism and Jesus, the Christ’s teachings, in that, his teachings were on morality.
. Its not just saying all is God. Or do good for heaven and do bad for hell. Any system of life should teach and lay path of life for all its aspects you can not sit at home without having food, by just reading bible. You need to work. That is what Hinduism (though such a term is misnomer) lays. Now you say, how can you compare apples and oranges?